AgroParisTech, French engineering school specialized in water and sanitation, has partnered with the ENGEES (National School of Engineers of Water and Environment of Strasbourg) and the OIEau (International Office of Water) to support the DINEPA in this project. Locally, the UEH (State University of Haiti) is also involved in this partnership. The funding of this program is provided by the Interamerican Development Bank (IDB) and the General Treasury of France (DGTPE), but also by several professional partners of the water sector in France such as the Suez group, Pont à Mousson and the Water Agency Seine Normandie. At the end of the process deposits of candidacies, initiated in June, a first selection was made mainly on record, by a selection board. The candidates who were selected based on their educational and professional, have then passed a written test on their knowledge in the areas of activities of the DINEPA followed by an interview to explain their motives before a jury representing the DINEPA, and AgroParisTech and the UEH. Many of them were able to demonstrate a strong work experience in the field [engineering curriculum in specialties related to the hydraulics (civil engineering, agronomy, etc.)] while others were recent graduates. Of 120 applications received, 27 candidates were selected to attend a pre-training in hydraulics to enable them to update their knowledge. The level of training is highly specialized, the final list of candidates for this training will be known and published after the pre-training. Stakeholders who will provide training come from universities and institutional actors with a recognized activity in the water sector in Haiti, but also businesses, consulting firms and French NGOs. The teaching is above all applied : interactive courses, working sessions in small groups, case studies, field visits, mini projects, time for discussion and presentation of work. The candidates at the end of their training will realize a Project of End of Study (PFE) that will address a real problem encountered by the DINEPA. Successful applicants will be hired by the DINEPA for a period of three years in the Technical Centers of operation (CTE), operators that manage the urban problems in cities of the country. The sector of drinking water and sanitation suffers from a lack of technical training especially for the operational trades. 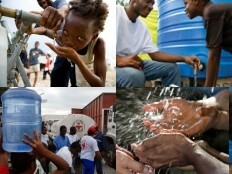 The training programs will be oriented on the sectors identified as priorities for water professionals in Haiti.